Zvi Schreiber is the CEO of Freightos, a logistics startup bringing international freight online for forwarders, shippers and oversized e-commerce. In November 2015, Beijing Century Joyo Courier Services registered with the U.S. government as an ocean shipping provider. So what? Well, Beijing Century Joyo Courier Services is a subsidiary of none other than Amazon. And earlier in the year, Amazon had already expanded its logistics presence with air transportation and trucking. Amazon’s entry into the trillion-dollar freight industry can have huge impact on Amazon‘s international sellers, importers and end consumers. But within the context of Amazon‘s modus operandi, it may spell even broader change in one of the world’s largest industries. In the past 20 years, Amazon‘s operating strategy has shifted from online retailer to B2B service provider, offering a stack of critical infrastructure as a service to other businesses. That’s a big part of what’s going on with Amazon Web Services, Fulfillment by Amazon, and Kindle Direct Publishing…We are creating powerful self-service platforms that allow thousands of people to boldly experiment and accomplish things that would otherwise be impossible or impractical. Scale the solution into a platform. Offer the platform as a novel solution for third-party businesses. For example, Amazon first created an efficient in-house computing cloud for their own IT, expanding it in-house before offering it to others in the form of Amazon Web Services. This same pattern has repeated in other sectors, including payments, e-commerce checkout and retail, as we’ll see below. Crucially, competitors generally do not see the change coming. When the term “cloud computing” was first used in 1996, IBM and Microsoft certainly didn’t anticipate that their biggest competitor would be a bookstore! Amazon has steadily evolved its retail services over the past 20 years. In cases where operations were initially outsourced, Amazon developed in-house, technology-driven solutions. Once successful, these solutions were offered as an external service to third-party businesses. In the online retail world, this process began with Amazon providing core e-commerce and packaging services, while wholesalers were responsible for sourcing books and warehousing them. Amazon team members would order books from wholesalers and stay up to 3 AM packing the books on the floor of Bezos’ garage. Delivery of the books would be outsourced to companies like UPS, as it still is today. As the e-commerce platform improved, Amazon started offering it as a service to third-party vendors in 2000, resulting in the incredibly successful Amazon Marketplace. Today, more than two million third-party sellers account for 40 percent of Amazon’s sales. 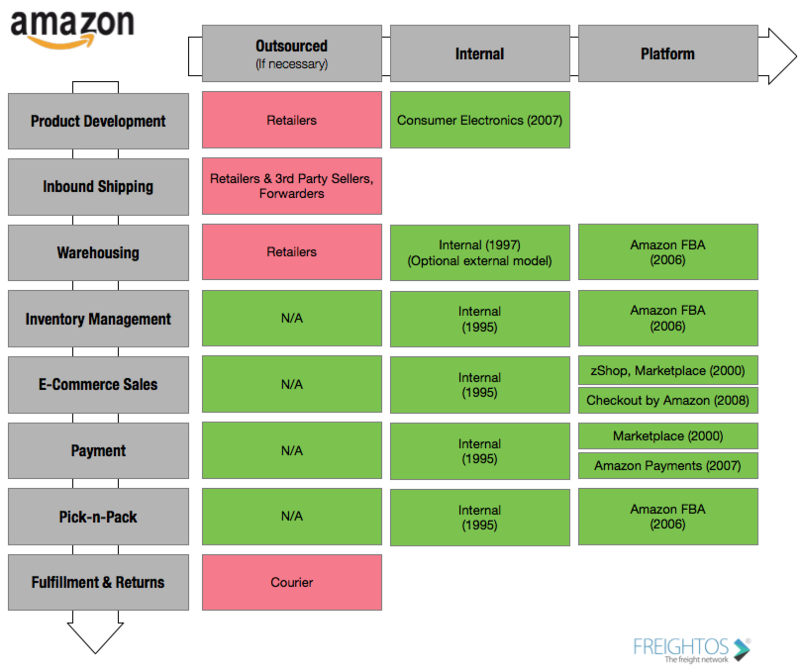 Scale and improved technology repeated the pattern with more efficient warehousing, leading to the 2006 launch of Fulfillment By Amazon (FBA). Along the way, Amazon Payments was also launched as a service in 2007, although it has not been particularly successful. An additional service, an e-commerce shopping cart solution called Checkout for Amazon, was the next service to launch (2008), although it too never took off. After scaling into services, Amazon began broadening its position across the supply chain, beginning with consumer electronics. This is one area where Amazon has seen its fair share of flops, including the Fire Phone and the Kindle Fire. While devices like the Kindle are effective as a content distribution strategy, product development has never reached the platform stage. In 2014, Amazon continued its expansion across the supply chain by focusing on logistics components that were previously outsourced — first inbound logistics and then, in 2015, home delivery. More than $1 trillion is spent on international freight annually, powering a global fleet of ships, airplanes and trucks that move more than $19 trillion dollars worth of goods across borders every year. Huge ships that carry up to 18,000 shipping containers move 90 percent of everything consumers eat, use and wear (just check the label on your clothes or devices). But the global freight industry is manual and inefficient. 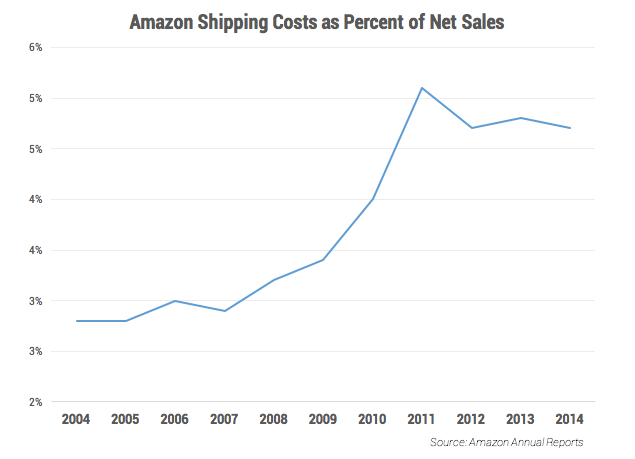 This is precisely the sweet spot for Amazon‘s approach of leveraging technology and scale to reduce costs. Amazon started by offering outsourced consolidation for international sellers in 2014, leveraging bulk discounts for cheaper U.S. import rates. Delivery was an even more important nut to crack. The free shipping (and rapid Prime delivery) that delights Amazon customers cost more than $4.2 billion dollars in 2014 — nearly 5 percent of net sales. In addition, the lack of control over outsourced processes can also impact customer delight, like the courier shipping delays in the 2014 holiday season. To reduce operating costs and dependencies on external providers, Amazon began to expand the role it played in delivery in 2015. In December 2015, The Seattle Times reported Amazon was in talks to lease an air fleet, while Amazon trucks started appearing on the road. For the first time, the iconic Amazon packages were delivered by Amazon employees, while Amazon also launched a crowdsourced delivery service. While this is a brand new business for Amazon, no company is better at tech-driven efficiency. More than 30,000 robots at Amazon warehouses are a testament to how powerful automation can be in the supply chain. This same drive also explains Amazon’s parcel drone-delivery efforts. 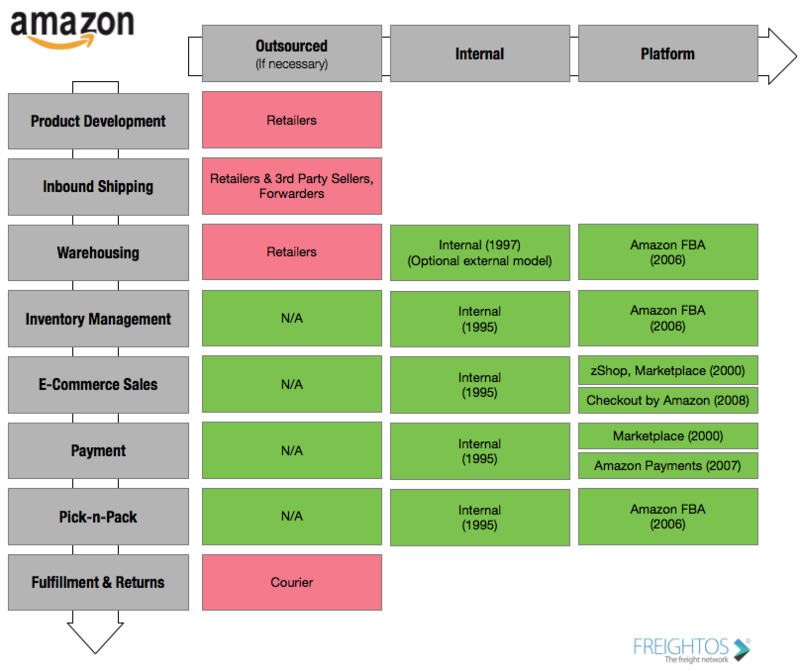 In this context, Amazon filing to function as a freight forwarder is as logical as it is bold. Amazon is entering a notoriously unautomated industry. Just getting pricing for freight quotes takes an average of more than 90 hours, and the industry is renowned for opaque pricing. 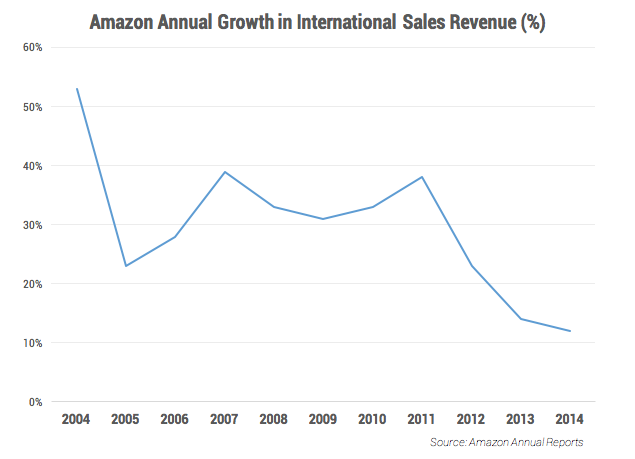 But Amazon‘s international revenue growth has stagnated, falling to a 12 percent growth in 2014 — modest in Amazon terms. Easier and cheaper shipping to Amazon sellers globally can revive growth, reduce Amazon’s own global shipping costs and provide more control over processes. Amazon has made a habit of extending internal services into third-party services. If Amazon successfully reduces fulfillment and logistics costs in-house, it’s unlikely these services will remain limited to use within Amazon. As an industry, logistics is ripe for technology-driven disruption. And no company is better at leveraging technology to broaden margins than Amazon. Logistics and delivery companies should be tracking these early days of Amazon‘s logistics play like hawks. 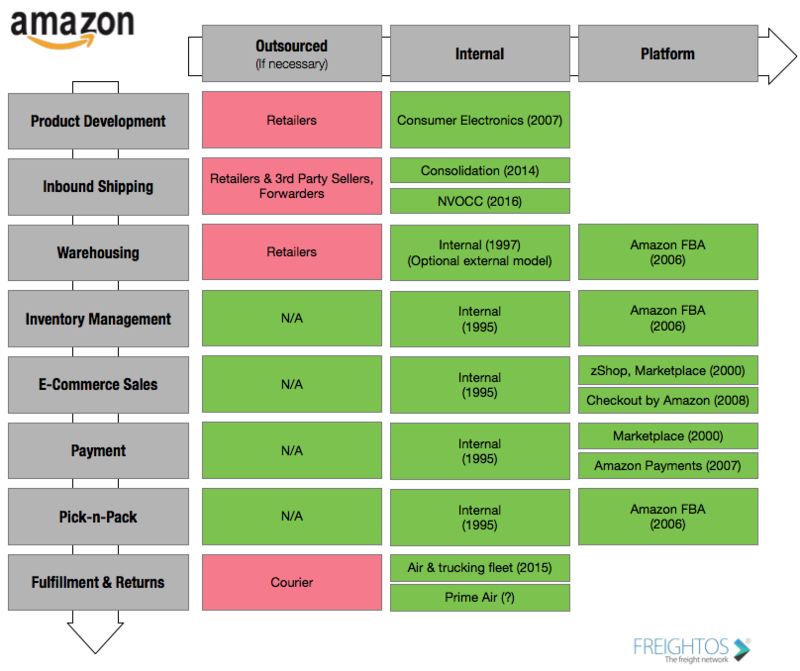 Unless the logistics companies can keep pace with the technological innovation that Amazon is likely to deploy, Amazon Logistics Services may emerge as a new platform in the next decade, unseating existing freight leaders.